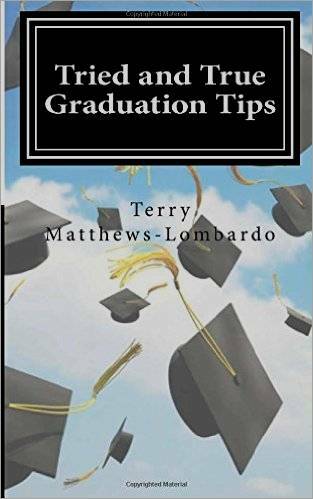 If I were a student today and on the precipice of graduating from high school or college, my mentor would be Terry Matthews-Lombardo, author of Tried and True Graduation Tips. At 50 pages, it’s a bite-sized read that even your most multi-tasking and short-attention-span offspring can (and should) make time for. Just be sure to buy two copies – one for them to vigorously mark up, yellow-highlight and dog-ear its corners and the spare to give to their kids. Q: Your new book, Tried and True Graduation Tips, is a must-have guide for students on the threshold of leaving the classroom and learning to navigate the workaday world. Turning back the clock, what were the thoughts, dreams and fears going through your head on your own graduation day? A: I have this great photo of myself and a group of my best gal-pals at our graduation and we were all smiley and giggly with our gowns flowing in the wind. Every time I look at it I’m reminded of how care-free and exciting that day was for us – mostly because we just felt like the world was awaiting our greatness! But also because, as I recall, we were fearless back then, perhaps more naïve than today’s grads, and certainly more clueless! Q: At what age did you know what you wanted to be when you grew up? A: I was fortunate to grow up in a family that did a good deal of traveling so at an early age that opened my eyes to the magic of learning about areas beyond my small hometown. The more places I visited the more I wanted to learn about other destinations, so a career in some part of that big wide industry was in the cards for me from the start. I was particularly fascinated by hotels, thus my choice for that major in college. Q: Who or what had the greatest influence on those aspirations and choices? A: My mother introduced me to reading James Michener, most of whose books are an incredible travel narrative that served to pique my curiosity about all those places he wrote about. And my father gave me the gift of opening my eyes to the world of travel so it was definitely a family affair. Q: If you could write a letter to your younger self in high school, what would you say? A: Dear Terry: If you work hard and play nice through it all, it will be alright in the end, so don’t try to predict the future. Que sera, sera! Q: Are public and private schools today doing as much as they could/should in terms of offering curriculum in career development? Q: If you were in charge of that curriculum, what would you do differently? A: I would definitely include a math class that explains basic finance in terms of matching your expenses against your income, understanding the whole banking process and investment systems, the importance of retirement planning (that seems so distant and useless until it isn’t! ), and so much more. Teaching math only in terms of algebra and geometry is useless on so many levels unless, of course, all your students are going to be engineers and physicians. But if you’re heading toward a non-technical professional career, you need real life vision regarding money. I do remember taking economics but the professor was so out of touch and it was all just so boring when it could have been presented in a relevant and meaningful way, applicable to life management. Q: To what do you attribute your expertise in this area? Q: What was your biggest goal in writing this book? Q: So what’s your response to those who might say, “My kid just graduated from college. Why would I need to buy another book on this subject? Q: I’m pleased to see that you’ve included information on manners, something that seems to be woefully lacking in today’s younger generation. Is it too late to counteract the combined effects of entitlement (gimme gimme gimme), parental indifference to etiquette rules, and the insularity/anonymity fostered by technology? A: No, I don’t believe it’s ever too late to encourage civility in one’s training! It does go against the grain of “I don’t need to really talk or communicate with people because I work on a computer all day”, but in the end we all know that every job requires some level of human interaction as does day to day survival. At some point you’ll have a conversation with your landlord. One day you’ll need to buy a car or house. Shoot, even basic things like a trip to the grocery store normally results in human interaction. There’s a new marketing campaign out right now that encourages “dark for dinner” indicating families should all put their cell phones and PDAs aside during one meal each day and, wow, just have a conversation! Brilliant, isn’t it? How great would it be if more kids were brought up with this kind of engagement instead of being glued to their computer screens all day long? There’s such a lack of basic interpersonal communication skills out there right now and it’s great to see this national campaign promoting old fashioned family chatter at the table. Q: What was your inspiration for those “Author’s Additional Five Cents Worth” tips at the end of the book? A: I’ve raised two successful kids (yes, beaming with pride) and I gave them both the list of “Ten Things I Wish My Parents Had Told Me When I Was Your Age” which is what I share at the book’s end. I made it very personal and I think every parent should do the same to help their kids feel empowered to ask questions and understand that just because you have a diploma doesn’t mean you have all the answers. Q: What’s the best graduation present a parent, relative or mentor can give? A: Good and sage advice – maybe via Tried and True Graduation Tips? (shameless self-promotion!) But seriously, I do include some great gift ideas in Chapter Three, one of which is a decent interview suit. For the most part, the college wardrobe is seldom considered professional, so basic pieces – not fashion statements – are what college grads need right away. Q: What did you give your own offspring for graduation? Q: Assuming that college was affordable for everyone, is a university education the best fit for every high school graduate? A: I don’t think it’s ‘the’ one size fits all answer anymore. There are so many great technical institutes and boutique training options out there specializing in all kinds of unique career paths that I really think if you do your homework (no pun intended) you can find something that’s affordable and makes sense to get you started on your career path. You hear the term niche or target marketing a lot these days and that applies to higher education opportunities as well. Q: Breaking into the competitive job market starts with having well polished interview skills. What are some of the top interview tips you’ve included in the book? A: A good self-introduction and a solid handshake are a must, and mastering both usually give you a boost of confidence that will carry through during the entire interview process. Simple but very meaningful and highly effective tools. Q: Like many authors, you opted for the self-publishing route. What governed this decision and what were the easiest/hardest aspects of donning the DIY hat of author, editor, publisher and marketer? A: I self published via Amazon/Create Space mostly for two reasons: 1] I knew this was a very short and simple book, and 2] I wanted to test the waters for any future publishing that I do. I currently have several other books in the works (don’t all authors?) and starting out with a short one to test the waters was the path I chose. It’s been an incredible learning experience and true to the advice I kept reading about from other authors, the biggest challenge is doing your own marketing, especially when it’s a non-fiction book. As you’re writing you might think that the formatting, uploads/downloads, cover art and all those elements are the biggest obstacles but then one day you get past all that and have an actual product at which time you turn inward and say, “Whew – I did it!” When in reality, all you did was print a book. I read some sage advice somewhere that basically said an author’s journey is only half done when the book is finished. The next half of the journey is to get someone to read it. So true! A: Writing is my encore career, and therefore I’m still gainfully employed as a professional meeting planner. But this also allows me to continue traveling, attending conferences, and giving me oh-so-much-more to write about! I’m also constantly getting magazine articles published along with always pitching more ideas. I feel it’s all part of (the necessity of) building your base as a writer, so everything I do now has that for a goal. Q: Where can readers learn more about your work (and, of course, buy your book!)? A: I love this quote from Mark Twain about becoming a writer: “Writing is easy. All you have to do is cross out the wrong words.” This is so true, and a reminder to me that every word I put on that keyboard counts! I try to write with purpose whether it’s to inform, entertain, or more often both because I think life can be a pretty serious journey. I also believe that everyone has a great story (or two) to tell, and I just hope that people are interested in mine!